Tails Gear is one of those crazy Japanese arcade shooters that put even experienced gamers to the test as they are incredible difficult to play through. If you ever played games like Ikaruga you know what I mean. 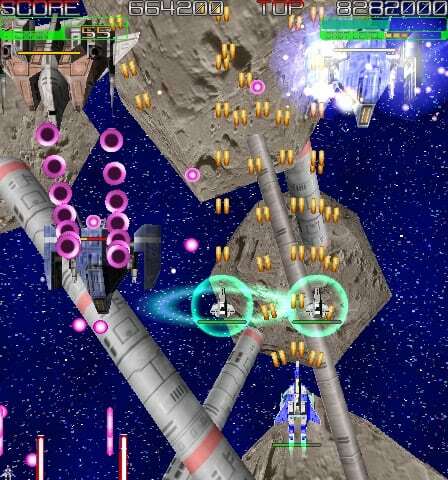 These games, often referred to as bullet hell games, stress you out completely and you have to be really skillful, or lucky, to avoid death while playing the game on your system. Graphics are excellent as is the game play as it offers all the great features of shoot em up games that you come to expect. Level ups, different attacks, interesting enemy formations, bosses and a lot more. One of the interesting features of the game are satellites that float around your ship that not only shoot on their own, but can also be ordered to stay at a certain place on the map while you are moving elsewhere. Tails Gear works fine with a gamepad but can be played as well using the keyboard. You shoot with Z and C and use a secondary weapon with X. If you are new to this type of games I suggest you start with the easy setting and experience the game on this stage before moving on to normal or hard. Hard is by the way very intense and you really need a calm hand to succeed in this mode. There are so many bullets and lasers on the screen that it becomes nearly impossible to dodge them all without crashing your spaceship. Tails Gear is a great game for a quick break or a rainy Sunday afternoon. It is easy to learn but very difficult to master. Take a look at the video to get a feel for the game's difficulty level. There are sometimes that many bullets on the screen that it is nearly impossible to evade them all. The game does not need to be installed and can be run from any location on your hard drive. The download is about 10 megabytes which is acceptable for this type of game. Make sure you download the main game and the update. Both are linked on the author's website. Just extract both and copy the files of the update into the main program folder. Your satellites have a shield that blocks bullets and lasers from reaching you. It depletes when they get hit but can be used effectively to protect yourself in certain situations. Fantastic shooter, with brilliant visuals, I’d call it. Great find.